The Journey of a Geek-in-Training. Medieval artists didn't have the benefit of modern conveniences like pre-mixed tubes of paint, or other ready-to-use materials. What they did have, was a deep understanding and connection with their tools and materials. 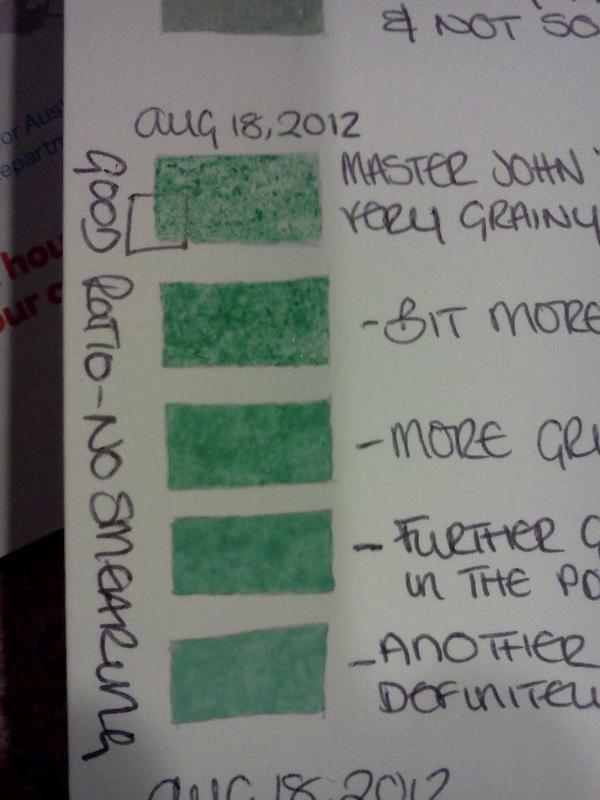 In this post, I try to learn and understand the use of green pigments. This particular green earth pigment remains my favourite as there's just something very pleasing about the hue. It's easy to mix up and goes on incredibly smoothly. I've always used it "as is" so that it remains fairly transparent when laid on the surface and there is great variation in pigment density, you can see this in the top swatch of Fig. 1 to the right. Cennini recommends adding calcium-carbonate (chalk, eggshells) for the working-up of earth pigments (pg? 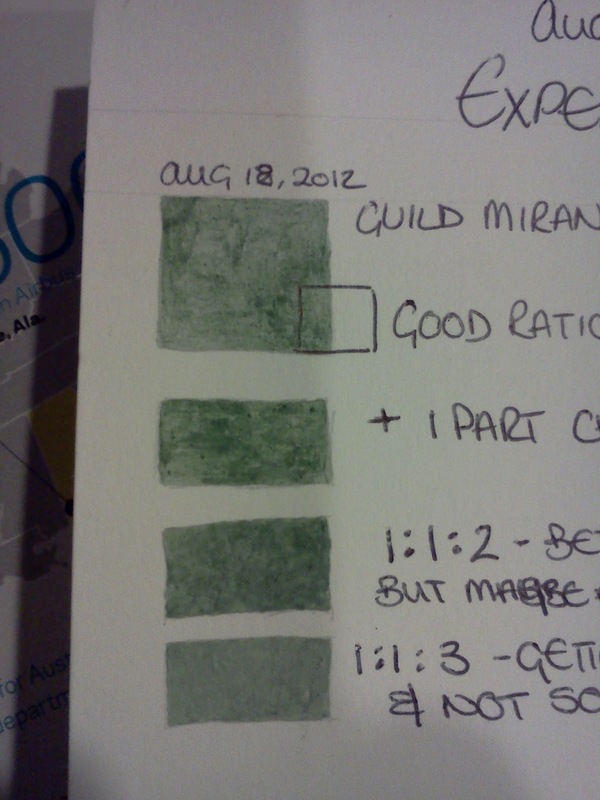 ), so counteract the transparency of this pigment I've used calcium-carbonate in swatches 2, 3, and 4 (fig. 1) from white eggshells to act as the inert filler. I think I am most pleased with swatch 3 as it retains a good colour but appears to also have a good opaqueness. Fig. 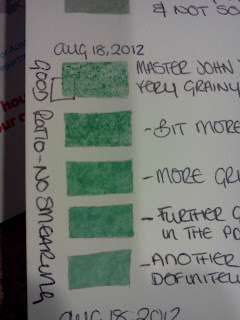 2: "Viridian" and "Terre Verte"
This earth pigment is more "green" in appearance (see the bottom swatch on fig. 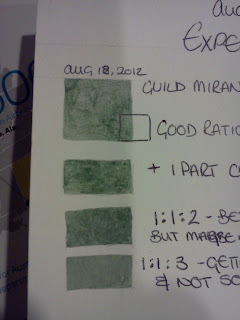 2) than the one from Guild Mirandola, actually reminds me very much of the "Olive Green" gouache from Windsor & Newton. I'm not completely sure how I feel about this particular pigment as a colour since I find it quite garish, and to be honest I also feel that way about the W&N gouache. Maybe it's because the natural opacity that it offers doesn't seem to have much depth? 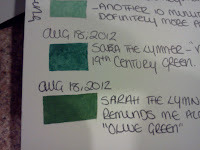 Viridian (see middle swatch in fig. 2) is a modern pigment first mentioned in the 19th century and therefore falls outside the preview of my interests, something I didn't know prior to experimenting with it. 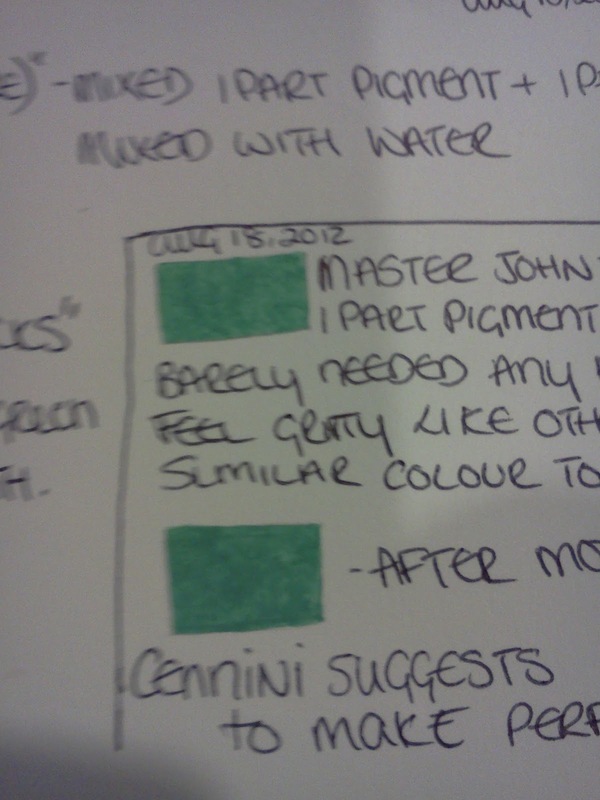 I actually find the colour a little "sickly" in tone and am quite glad that I can eliminate it from my palette. Fig. 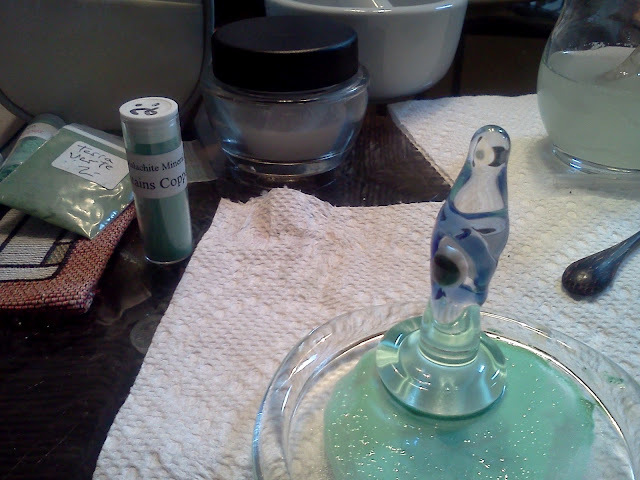 3: Malachite at various stages of mulling. 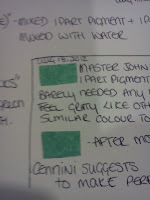 "A few colours, such as malachite, must be ground as little as possible or they become pale; but these are exceptional." (Thompson pg?). This statement worried me a little when I first read it, but then it turned into an experiment to incrementally mull the pigment / binder until it looked and felt right. Once I achieved the look and feel of what I think it should be I then mulled for a further 10 minutes to try and get the "pale" colour Thompson mentions. Painted malachite, to me, looks very much like the green used for calligraphy in many of the Anglo-Saxon manuscripts. There will be a more in-depth post about malachite and it's preparation for use as a pigment. When considering malachite, one should also take azurite (blue) into consideration as they come from the same mineral and much of what will work for one will work for the other. "The manufacture of verdigris, an acetate of copper, illustrates the treatment of metals with acids to produce coloured salts. Plates of copper hung over vinegar are affected by the acetic acid vapurs rising from the vinegar, and copper acetate is formed upon the surface." (Thompson 79). "Take care never to get it near any white lead, for they are mortal enemies in every respect." (Cennini 33). As a pigment I liked using verdigris, and I also feel that much of what I see in manuscripts and assume to be malachite may actually be this copper green. There will be more research on this. Cited works can be found in my General Bibliography, or in the additional sources listed below.